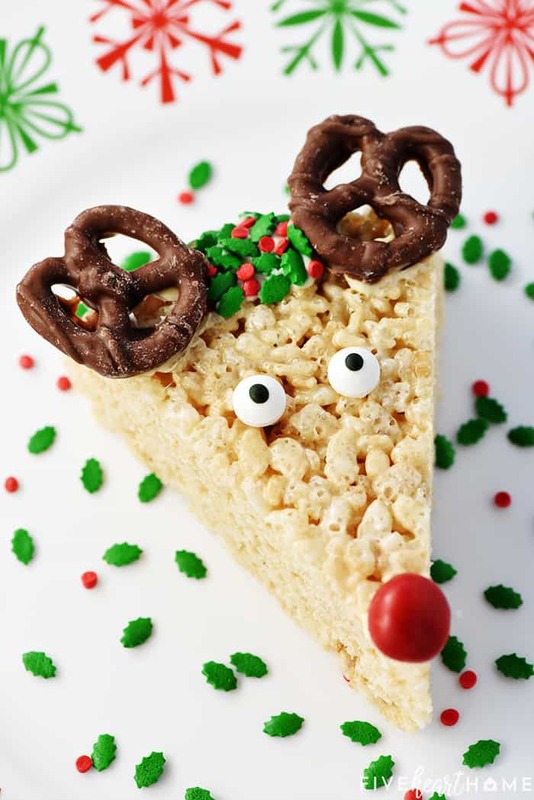 Reindeer Rice Krispie Treats are cute, festive, and easy to make…a fun holiday project for the kids and a yummy treat to share with neighbors and friends! 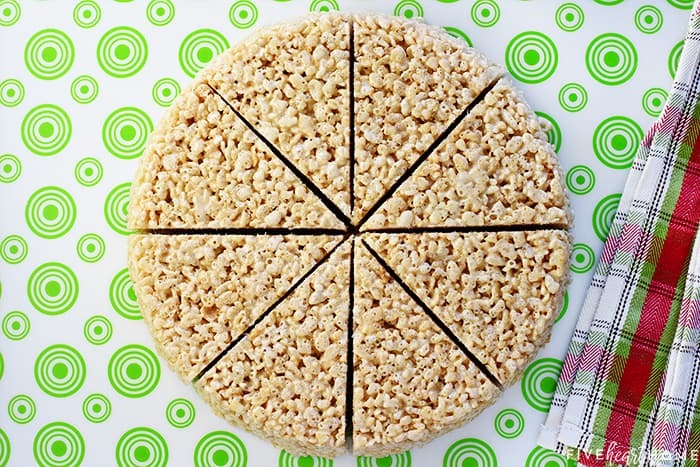 Raise your hand if you love Rice Krispie Treats! My hand is raised high, y’all. There’s just something so yummy about these chewy, gooey, marshmallow bars. Or in today’s case, wedges. 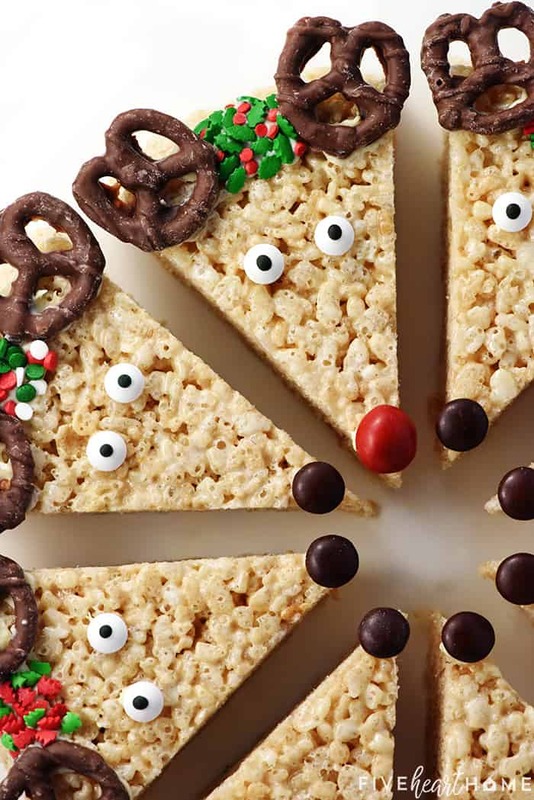 Because I actually spread the classic cereal mixture into a cake pan, sliced it like a pizza, decorated each piece, and ended up with — ta-daaaaaa! 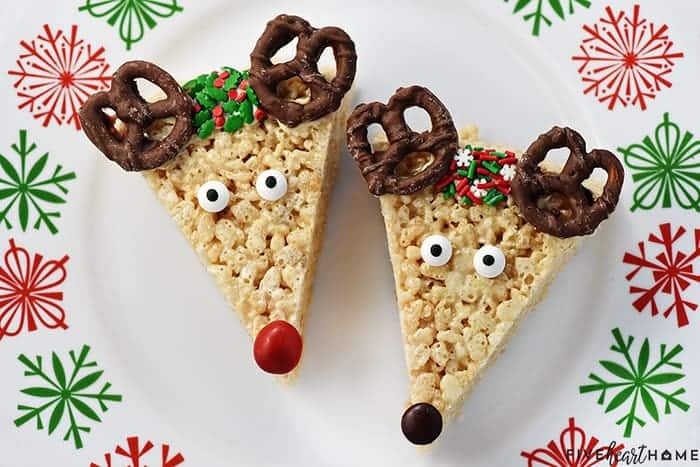 — scrumptious, adorable Reindeer Rice Krispie Treats! Seriously. HOW. CUTE. ARE. THESE?!?!?! And so simple to make. You won’t even believe it! As previously mentioned, I started out by making regular ol’ Rice Krispie Treats in a round cake pan. Once the mixture was cool, I turned it out of the pan and used a big knife to slice it into eight equal wedges. Now hold it right there! you may be saying. Aren’t there eight reindeer PLUS Rudolph?! Why, yes. Yes, there are. However, unless you possess the spatial reasoning to evenly divide a circle into nine wedges, I invite you to instead cut your circle of cereal deliciousness into eight pieces. Decorate one reindeer as Rudolph, and give him only seven sidekicks. Nobody ever cared much for Blitzen anyway. Alternatively, you could decorate ALL of your reindeer as Rudolph! Because, really, who wouldn’t pick the reindeer with the red nose? Back to the decorating, though…it was as easy as it looks. I melted about an ounce of white chocolate (you can use a baker’s square or candy coating or candy melts) and used the end of a small spoon to paint some on the back of the candy eyes and M&M nose and chocolate pretzel antlers. Then it was simply a matter of press and stick! 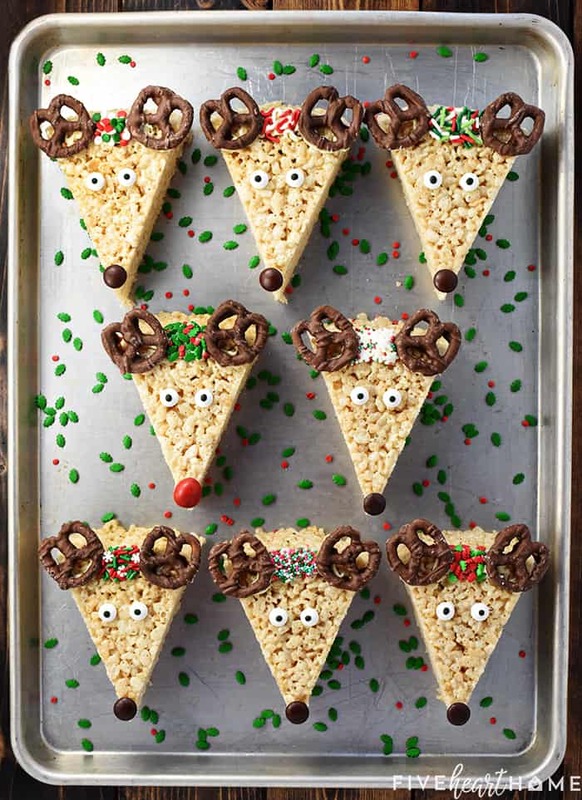 After turning my triangular cereal treats into reindeer heads, I decided something was still missing. 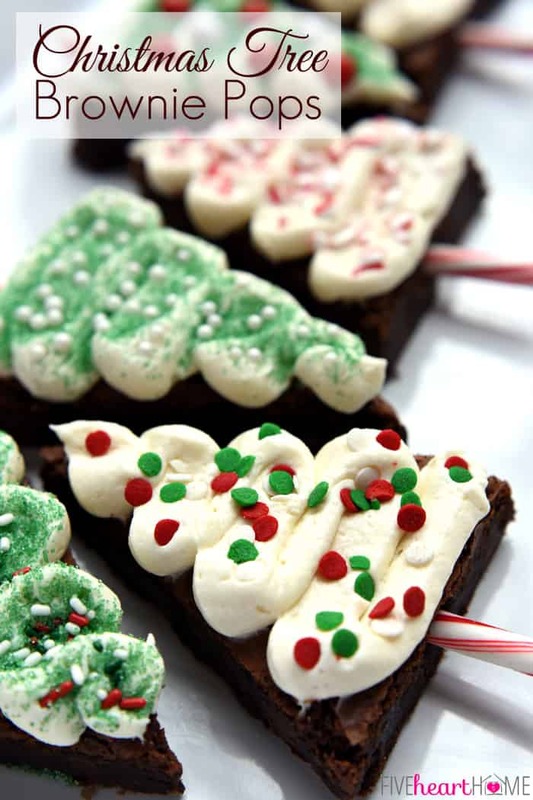 So I went for a splash of extra color and pulled out allllll of my Christmas sprinkles! I spread some freshly melted white chocolate onto each reindeer’s “forehead” and then scattered and pressed sprinkles into the chocolate. 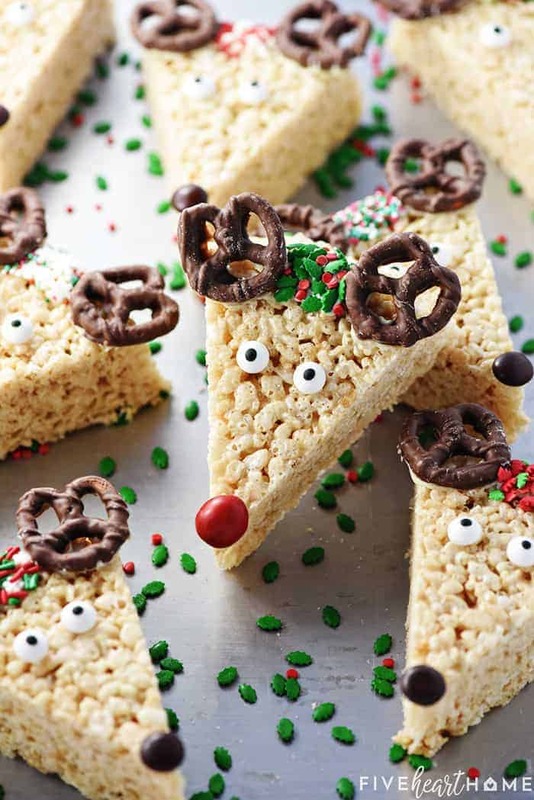 And that was all it took for these yummy, charming Reindeer Rice Krispie Treats! 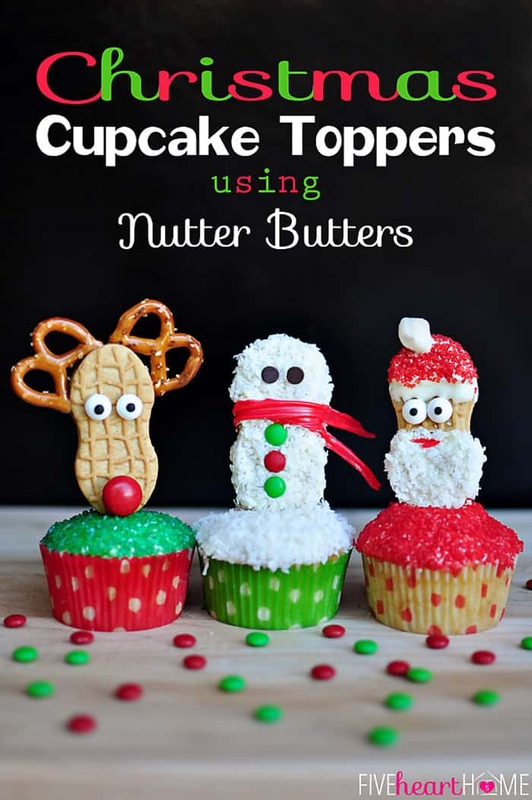 Wouldn’t these be such a fun addition to a Christmas cookie platter? 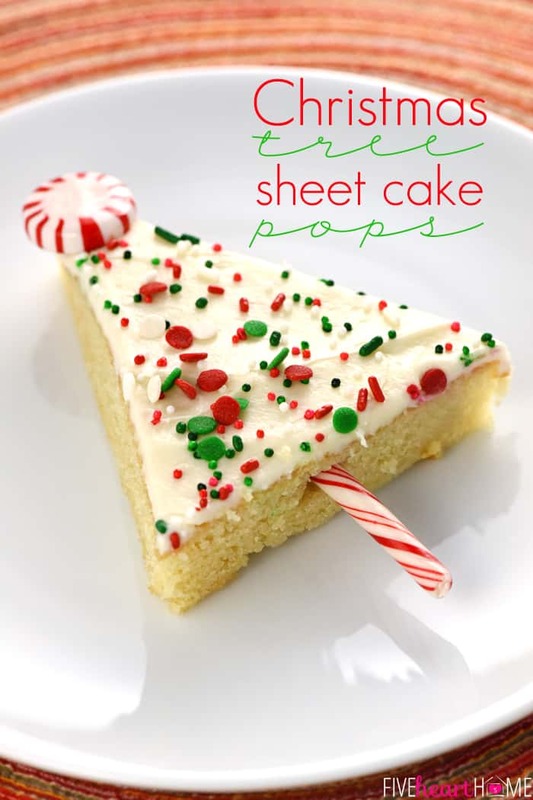 Or gracing the dessert table at a holiday party? 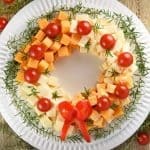 Or wrapped up as a gift for friends, neighbors, teachers, or anyone to whom you’d like to spread a little seasonal cheer? Or, heck, even left out for Santa on Christmas Eve? Okay, scratch that last one…Rudolph may find eating an effigy of himself to be rather sadistic. But everyone else? Everyone else is guaranteed to LOVE THEM. Be sure to generously butter your pan so that the cereal mixture will pop right out when you flip the pan. I ran a thin knife around the edge of the pan before overturning to give it a little extra help. 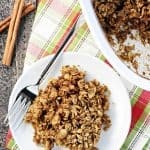 You probably already know this trick, but my secret for pressing Rice Krispie Treats into a pan without the mixture sticking to everything is to use wet hands. If your hands and fingers are wet, the gooey marshmallow won’t stick…it really works! I used regular brown M&Ms for all of the reindeer noses except Rudolph’s…for his I used a large red peanut M&M. If you don’t have M&Ms, you can use other brown or red candies for the noses. 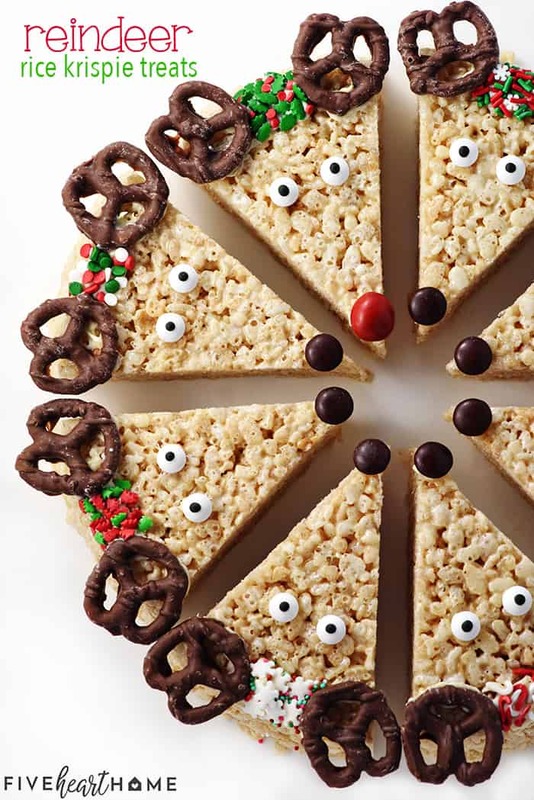 Feel free to swap regular salted pretzels for the chocolate covered ones as the antlers. 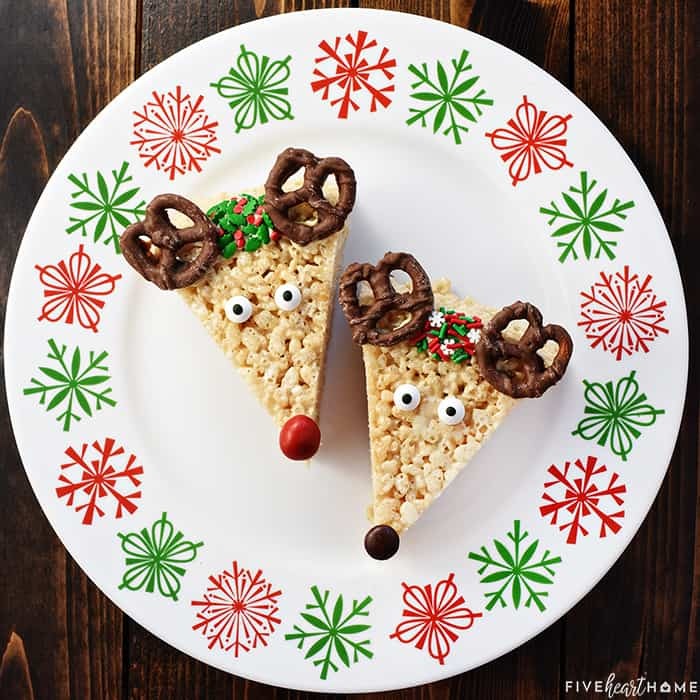 Reindeer Rice Krispie Treats are cute, festive, and easy to make...a fun holiday project for the kids and a yummy treat to share with neighbors and friends! Generously grease an 8-inch cake pan; set aside. In a large pot set over medium heat, melt the butter. Add the marshmallows, stir to coat with the butter, and allow to completely melt, stirring frequently. Remove the pot from the heat and gently mix in the cereal until fully combined. Transfer the mixture to the prepared pan and press into an even layer. Allow to cool completely. 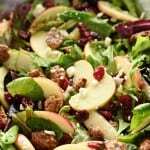 Run a thin knife or spatula around the edge of the pan, lay a platter or cutting board on top, and invert. Carefully lift off the pan. Melt half of the white chocolate according to package directions. 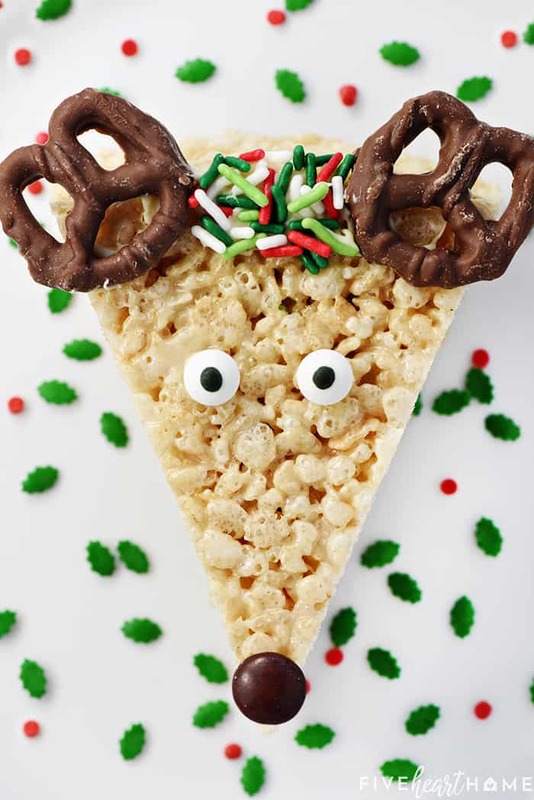 Spread a small amount of melted white chocolate on the back of the candy eyes and stick them to the top of one of the triangular Rice Krispie Treats. Do the same with the M&M nose and the pretzel antlers. Repeat for each reindeer. Melt the rest of the white chocolate. 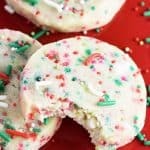 Finish each reindeer by spreading some melted white chocolate between the antlers, covering with sprinkles, and gently pressing them to adhere. 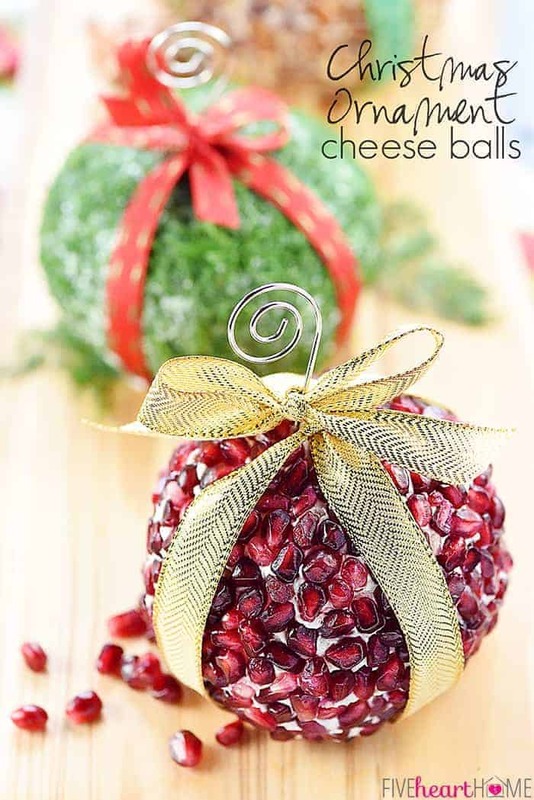 Allow the white chocolate to harden before serving the treats or storing them in an airtight container.